Fitted with a gussett in both jaws to maximise contact between the beam and beam clamp, increasing the grip. 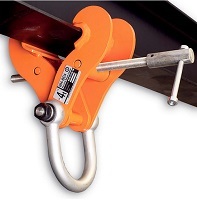 The clamp can be used to an angle of 45 degrees from vertical. When the angle moves away from vertical, the capacity reduces.